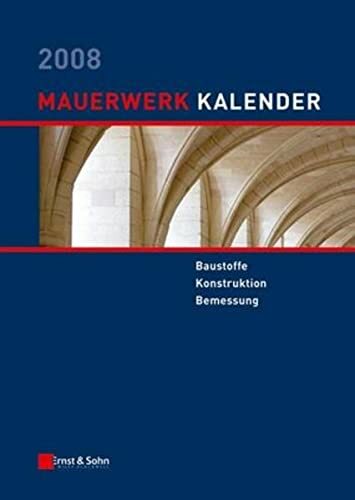 Mauerwerk Kalender 2008 by Baustoffe: WILEY 9783433018712 - LIMEROCK BOOKS INC.
Mauerwerk-Kalender (Masonry Yearbook) The yearbook in its 33. volume with a well-balanced ratio between up-to-date and revised contributions gives consideration to the versatility of masonry as a structural carrying element, wall construction material with building-physical and aesthetical functions, as the medium of innovation in prefabricated structures and for energy-saving buildings. All new developments which require approval will be introduced with the up-to-dateness of a yearbook. Renown civil and structural engineers will give practical advice all around masonry for the design and executional designing of damage-free structures. Herausgeber: Prof. Dr.-Ing. Wolfram JAger, Lehrstuhl fUr Tragwerksplanung, TU Dresden und IngenieurbUro JAger GmbH, Radebeul. Prof. JAger ist Obmann des DIN-Spiegelausschusses "Mauerwerksbau" und des DIN-Arbeitsausschusses "Rezept- und Ingenieurmauerwerk" und Mitglied der CEN-Gruppen Eurocode 6. Die Wahl der Autoren fUr den Mauerwerk-Kalender ist durch konsequente PraxisnAhe bestimmt. An diesem Jahrgang arbeiten Autoren aus der Industrie, namhaften IngenieurbUros und dem Deutschen Institut fUr Bautechnik (DIBt), Berlin, mit. Weitere Autoren sind mit ihrer TAtigkeit an der Schnittstelle von Forschung und Praxis an den UniversitAten anerkannte Fachleute auf ihrem Gebiet.